In California, Technology Makes Droughtshaming Easier Than Ever : The Two-Way As California's drought continues, social media and smart phone apps let just about anyone call out water waste, often very publicly. 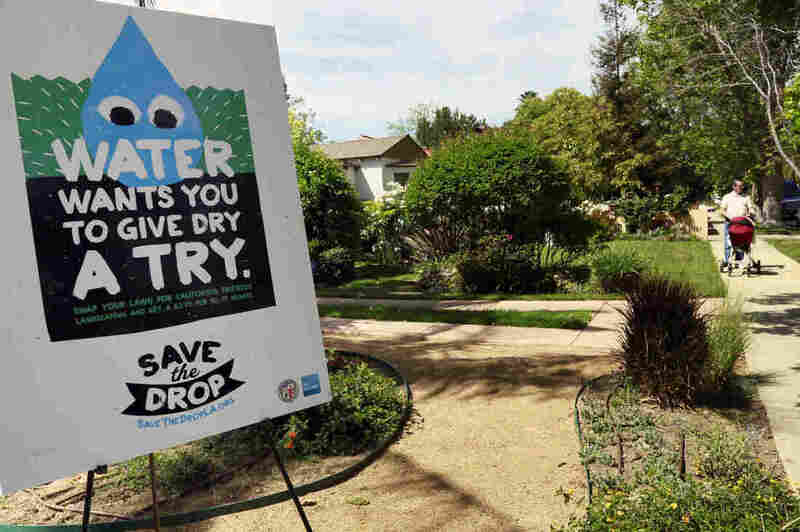 A sign encouraging people to save water is displayed at a news conference in Los Angeles. Water use restrictions in California amidst the state's ongoing drought have led to the phenomenon of "droughtshaming," or publicly calling out water wasters. There's another, newer app devoted only to droughtshaming, and it's called, obviously, DroughtShameApp. Creator Dan Estes, a Santa Monica real estate agent, says he made the app just a few weeks ago out of a feeling of responsibility.